Usage of traditional physical controllers in virtual reality environments is surprisingly complicated, and usage of keyboards in the same environment is barely possible at all even for experienced typists. This despite the fact that physical keyboards are beneficial even in VR for various applications, including gaming and productivity, which had pigeonholed VR developers into making use of sub-optimal input schemes for their software. However the good news is that this problem may soon be coming to an end, as Logitech and HTC have announced that they are teaming up to enable usage of real keyboards with tactile feedback in virtual worlds. 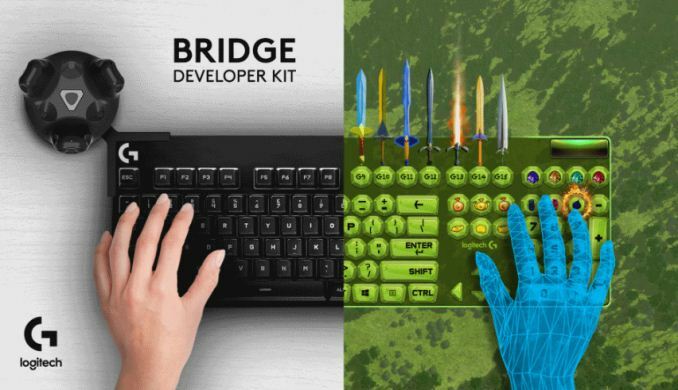 Logitech on Friday introduced its Bridge software development kit, which designed to enable programmers to implement usage of a physical keyboards into their virtual reality applications. The kit consists of a Logitech G810 Orion (based on the picture) with a special mounting accessory that attaches a Vive Tracker to the top left corner of the keyboard, and the associated software. The Logitech G Bridge SDK (beta version) will be available for $150 to developers selected by Logitech. Interested parties need to apply to Logitech for the kit by November 16th. 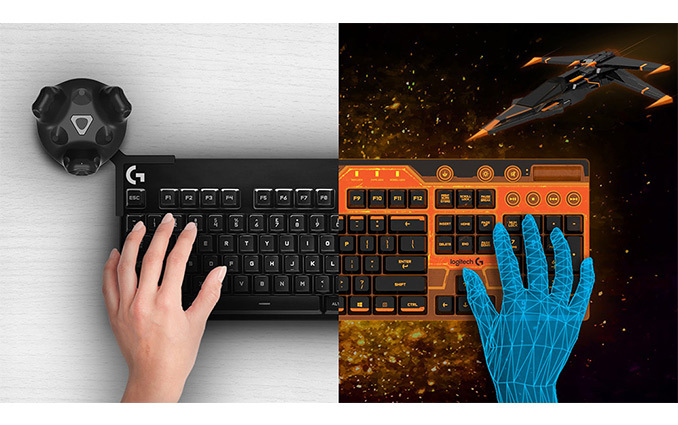 Logitech and HTC are not explaining precisely how their technology works, but based on the press images they've sent out, the Vive Tracker senses positioning of hands above the keyboard, whereas software renders the keyboard and recreates movements of hands in virtual worlds. Logitech claims that such approach can help create virtual context-aware keyboards for both gaming and non-gaming applications. For example, they have managed to implement a keyboard across the Steam VR system. 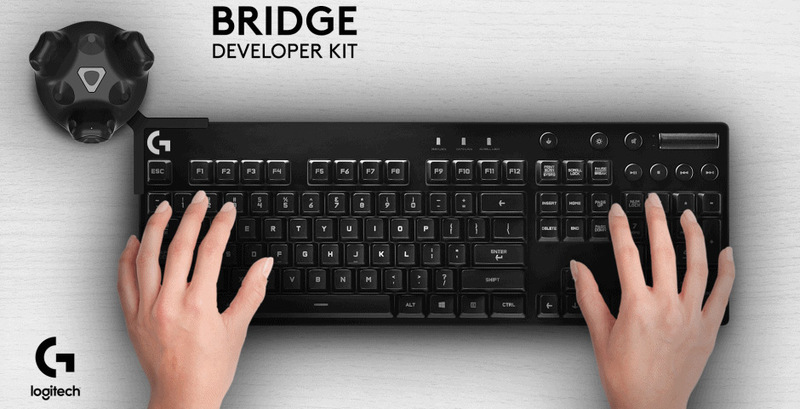 The general principle of the Logitech G Bridge seems to be rather versatile; it may be used for various applications and re-created by other VR platform holders. Meanwhile, there is a major caveat with the method: latency. The Vive Tracker may feature a “low latency”, but it is definitely not as low as the real time. Therefore, the software is going to recreate movements of hands with a delay, possibly after the system registers actuation of a key. Obviously, latency is a challenge for VR in general and platform holders (HTC, Oculus VR, etc.) are trying to address this issue. Over time, input latencies will shrink and this is when physical keyboards in VR worlds will shine. In the meantime, software developers can prep programs that can support physical keyboards properly. Is this going to be tied to a specific keyboard or will it work with arbitrary physical layouts? eg widths of bottom row keys, total number of keys on the keyboard, shape and size of shift and enter keys (internationalization is fun), laptop vs desktop, media keys, etc?